I love a quick spaghetti recipe! I need dinner ideas (and lunch ideas) that come together quickly, don’t you? Once a week my friend Kim comes over and our homeschool kiddos hangout and she and I work on organizing things in my house. (I really do not deserve her friendship, she is so good to me!) Sometimes I make lunch. This quick spaghetti recipe is super easy and it feeds an army. It easily serves ten very hungry folks, including growing teenage boys. This is perfect for a busy weeknight when you’re needing easy recipes to help make dinnertime less stressful. Here is how I make it. Fill a large pot with water that can hold 2 lbs of spaghetti noodles. Put the pot over a high heat on the stove so it can begin to boil about the time your meat is almost done. 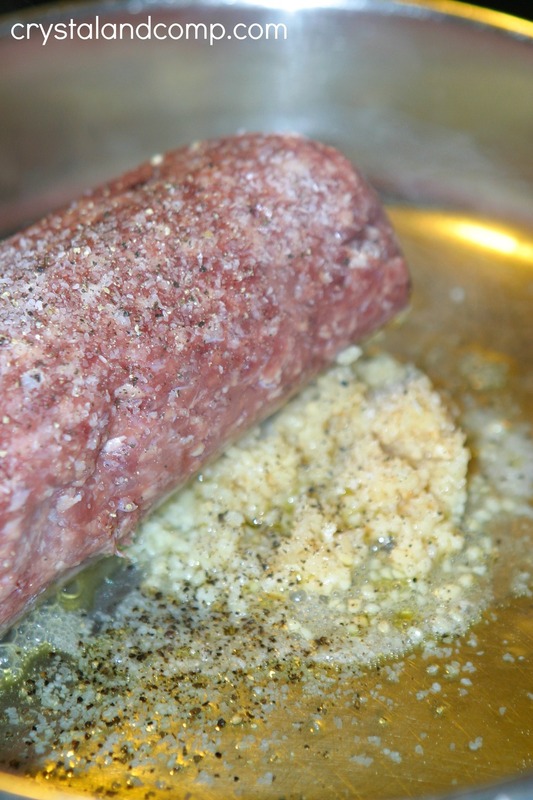 In a skillet, over medium heat, add 2 T olive oil, garlic, your beef and salt and pepper. Crumble the beef with a large cooking spoon, mixing it well with the other ingredients in the skillet and evenly distributing it over the heat. Continue cooking until it is well done and browned. Once the ground beef is brown, add your spaghetti sauces. I am in love with this Trader Joe’s Traditional Marinara Sauce. They are 18 oz jars and only $1.29. The flavor is amazing! I use 3 jars. Slowly add each jar and combine well with the meat. Once all the sauces are added, move the heat to low and let it simmer. About this time your water for the noodles will be boiling. Cook them for 9 minutes and then drain. Now it is time to plate it up. Place a large pile of noodles on each plate and top with two hearty scoops of the meaty sauce. This is key, top with a generous amount of shredded Parmesan cheese. I love Trader Joe’s version. The flavor is rich and fresh. It will begin to melt immediately. Serve it with some cheesy bread and dinner (or lunch) is done. This cooks in about 30-40 minutes. Boiling the water is what takes the longest. You’ll love it any time of day and any night of the week. This is also perfect if you’re having out of town guests in for the holidays and you need to feed a crowd on a budget. 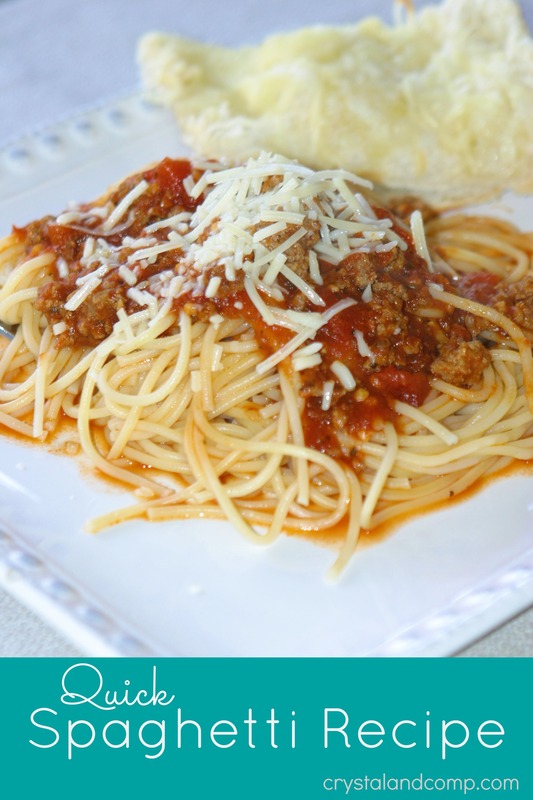 What is your favorite way to make quick spaghetti? A quick spaghetti recipe that cooks in 30-40 minutes and feeds a crowd. Easy recipes like this are perfect for busy weeknights! Crumble the beef with a large cooking spoon, mixing it well with the other ingredients in the skillet and evenly distributing it over the heat. Continue cooking until it is well done and browned. Once the ground beef is brown, add your spaghetti sauces. 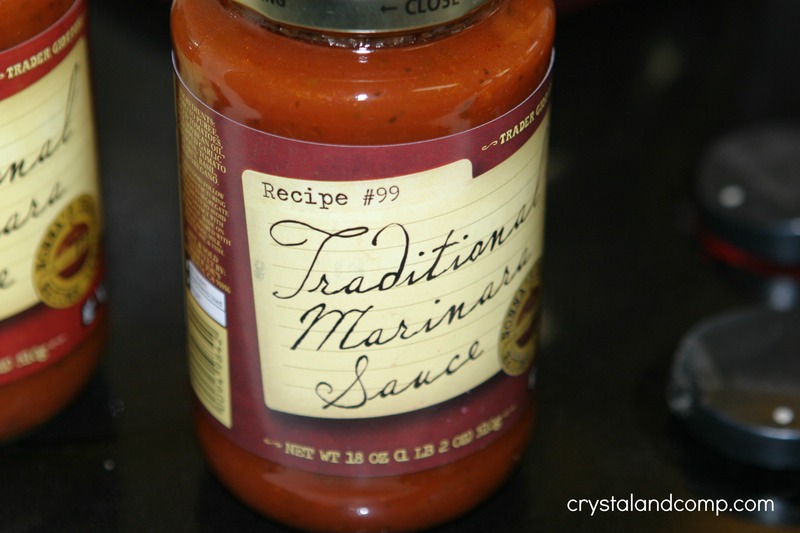 I am in love with this Trader Joe's Traditional Marinara Sauce. They are 18 oz jars and only $1.29. The flavor is amazing! I use 3 jars. Slowly add each jar and combine well with the meat. About this time your water for the noodles will be boiling. Add the noodles to the boiling water. Cook them for 9 minutes and then drain. Now it is time to plate it up. Place a large pile of noodles on each plate and top with two hearty scoops of the meaty sauce. This is key, top with a generous amount of shredded Parmesan cheese. I love Trader Joe's version. The flavor is rich and fresh. It will begin to melt immediately. 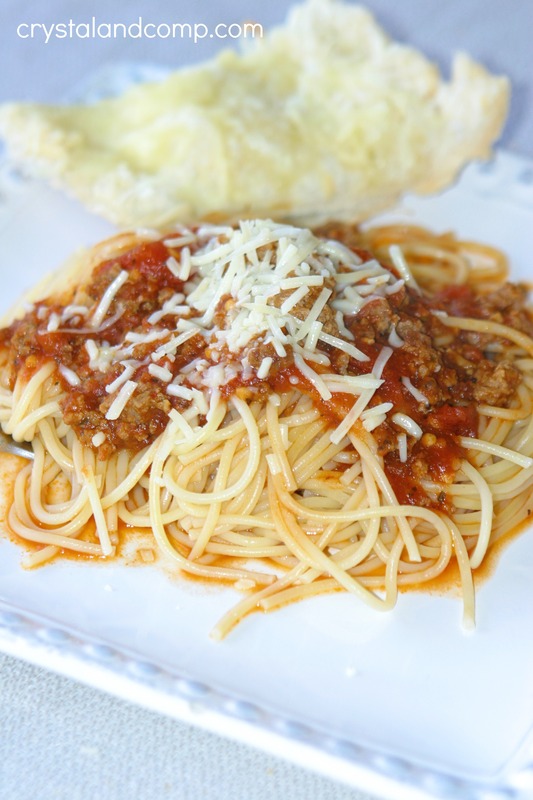 Spaghetti and meat sauce is a family favorite around here. I usually wait until my favorite pasta goes on sale for 99 cents a box and then stock up. 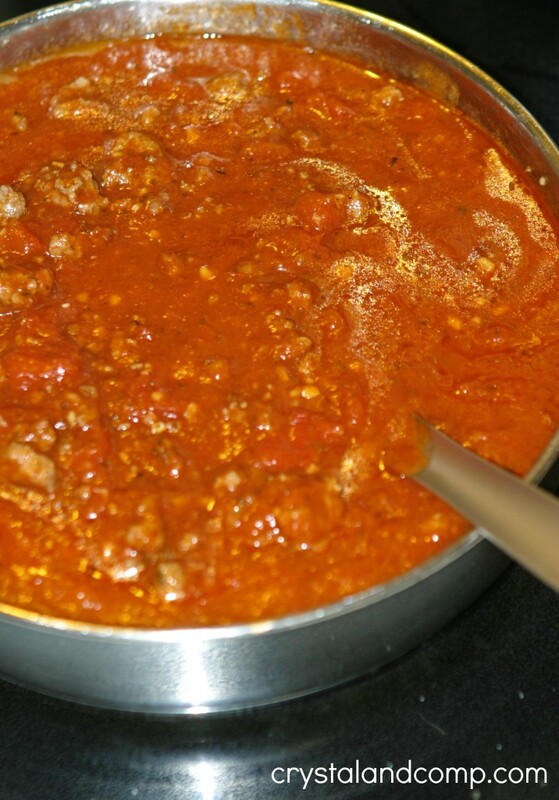 Pasta sauce is always kept on hand and ground beef is a staple in the freezer. Done and done. This is the dinner of champions! 🙂 Makes mom a “super hero”. I totally agree with you. It is such an easy dinner idea to keep stocked up on. We love it too! This is my favorite meal! The parmesan cheese is the best part. 🙂 Thank you for feeding us! The sauce is from a store called Trader Joe’s. It is kind of like Aldi, but only die free, organic, non preservative foods. This sauce is their store brand. Super yummy! Thanks so much for sharing this awesome recipe with Full Plate Thursday and hope you are having a great weekend! Totally love this. Now, please do not misunderstand but my hubby would say that this is his favorite way to eat spaghetti because it is just like the cafeteria at school when he was a little boy. His memory of it is that it was FABULOUS! The cafeteria ladies always gave him seconds, because of his zeal. Now, grass fed? I doubt it very much. But he loves it served this way. I think I’ll have to make him some. About how many people does this feed? I need to feed a group of 100 people. How many times would you double this? This fed 8-10 grown ups. To feed 100… you would need to double it 10 times….